Never underestimate the tenacity of someone from Central Mass that is is on a mission. 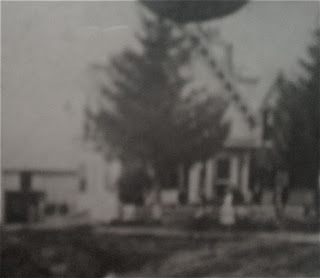 In my last post, "A Sturbridge Mystery", I posted an old photo collage of a Sturbridge family. I asked for help in identifying the family, and the locations in the photos. Well, one long time reader took my request to heart. Miss Hyde is likely related to the Hyde of the Joshua Hyde Library (a guess). Page 170, Section 1014 of a book titled The Richardson Memorial, written by John Adams Vinton mentions the Minister in Sturbridge as Martin Luther Richardson from 1867 "to the present time." "He was a member of the Massachusetts House of Representatives from Sturbridge in 1871. He has no children." Here's the link. Hmmmm. Time frame seems right, and he was a State Rep, too. Well, this would account for the young boy labeled "Will" in the collage. And, now this record acknowledges who "Hattie" was! So far, we've identified the family, and two of the children. There was a comment in the original post questioning whether or not the house labled as "Our Cottage" was the yellow Brunell House just past the common on Main Street. The photo to the left is not clear, but in the original photo it is much clearer. Unlike the yellow house, the "cottage" doesn't seem to have the second floor balcony, and to there is a also an "ell" to the right in the photo to the left that isn't part of the yellow house. Now, all we need is to identify the other folks int he collage, and the location of the homes. The photographs must include a spelling error, because the selectman mentioned as Whittmore, was actually Whittemore. Whoops. My fault. Just wanted to shake up the research a little. Here's info on the Hyde women (regarding Miss Hyde in your photo) listed in the same census as the Rev. martin Luther Richardson. They ARE part of the family of Joshua Hyde. You have a great deal of Sturbridge history in your mystery photographs! I wonder if there are any members of this family still in town? Thank you for all your hard work, Marilyn, and for sharing it with all of us. You learned a lot about our mystery family, now all we need to do is to identify the houses in the photo. Maybe, old census data will show who lived where, and when...(hint, hint). Are you getting tired of hearing about these folks yet? I'm still finding stuff. Martin Luther Richardson [Parents] was born on 18 Apr 1830 in Winchester,Middlesex,Ma. He died in 1916. He married Angeletta Wilson. Angeletta Wilson [Parents] was born on 18 Jan 1831. She died in 1908. She married Martin Luther Richardson. M i William Shed Richardson M.D. William Shed Richardson M.D. [Parents] was born on 11 Jul 1860 in Woolich,Sagadahoc,Me. He died on 9 Feb 1912 in Marlborough,Middlesex,Ma. He married Mary Hubbard Morse. Mary Hubbard Morse [Parents] was born on 7 Jan 1865 in Marlborough,Middlesex,Ma. She died on 5 Aug 1949 in Montague,Franklin,Ma. She married William Shed Richardson M.D.. He was a trustee of Hitchcock Academy (Brimfield) for 17 years! Wally, I wonder if the parsonage listed here might be "our cottage" as it is called on your collage? If you have a chance to get down to Maple Street or ask the right people, you may get some info on that. I'm sure I read somewhere today (Where did I read it????) that Martin Luther Richardson built a parsonage in 1868.